Als u ons op afspraak bezoekt, maak telefonisch een afspraak. 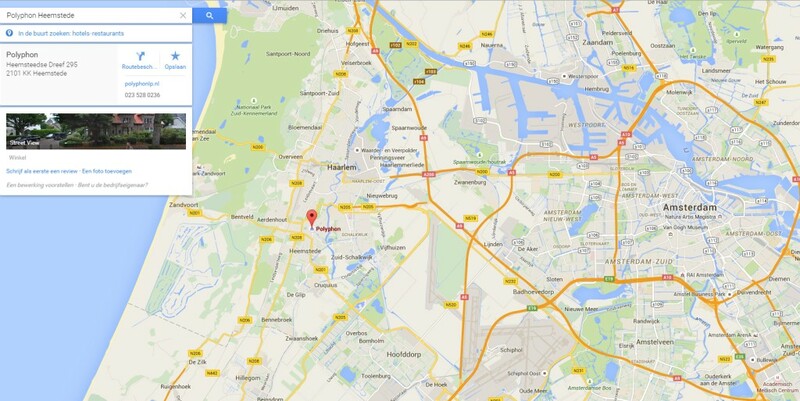 Polyphon (Heemstede) is located near Amsterdam and its airport (Schiphol). From Schiphol/Amsterdam Airport to our house at one hour drive maximally: take the so-called (red) R-Net bus No.300 to Haarlem Central Station (every 6 minutes); change to (red) R-Net bus 340 (every 10 minutes) and leave at stop 'Heemstede Blauwe brug'. Then only a 150 meters on foot following the bus. If you are here: 8 trains an hour between Haarlem and Amsterdam (Central Station) and will cost about 15 minutes time! Welcome 7 days a week, however only by appointment because we don' t have regular hours of business.